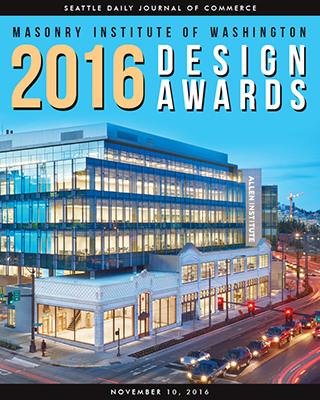 The reconstruction of the 1920s Ford McKay and Pacific McKay buildings in South Lake Union earned the top award for modernization and restoration. Judges also honored the project with a design integrity award. BOLA Architecture + Planning was the preservation architect. 2016 Masonry Awards special section here. The Masonry Institute of Washington celebrated 15 projects Wednesday night at its Excellence in Masonry Design Awards banquet at the Rainier Club in Seattle. 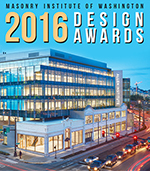 The MIW awards honor outstanding architectural design where masonry products — brick, concrete block, stone, tile, terrazzo and marble — figure prominently into the overall building design. The judges were Roman Schlaeger of Design Partners Architects, Chicago; William Taylor of Green Associates, Chicago; Thomas Norman Rajkovich Architect, Evanston, Ill.; and Daniel Albo of the University of Chicago – Facilities Services. The MIW holds its awards program every two years. The association was established in 1972 to promote masonry construction throughout Western Washington. It also serves as an education provider and technical resource for building industry professionals.